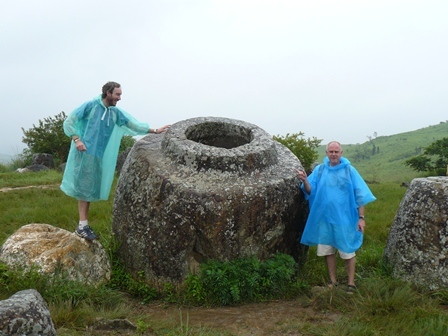 We don’t usually take ‘organised’ tours, but it appeared that was really the only way to visit the Plain of Jars. Mima did some pretty good negotiation and managed to get us a trip with a guide/driver, 2 jar sites, the whisky village, Muang Khoun (the old capital) for 120,000kiph. Entry fees to the jar sites were additional (10,000 kip per site) as was lunch. Our little tour group was just 5 people, Mima & Scott (the kiwi), Nathan (an Aussie who is on the homeward leg of a 4 year trip round the world without catching a plane) and us. Great company. Site 1 is the largest, about 15km from town. The first part of the road is tarmac (in pretty poor condition) then dirt road which became more rutted, pot-holed and slippery as we went. The site is huge and has about 250 jars. They are huge, one with a lid and another with a carving of a person. It is a really pretty site despite the trenches (front line fighting) and bomb craters all over the place. Site 2 is much smaller, on top of a hill which in good weather would have magic views. 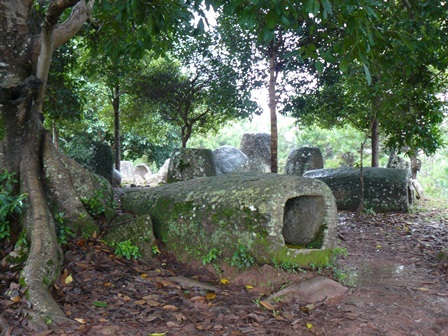 It is under trees (unlike site 1) and has some huge almost square jars. 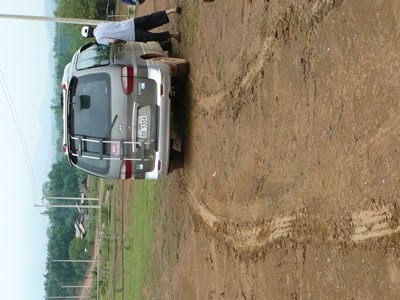 It was a super slippery & muddy drive there and more mud collected on our sandals on the walk to the jars. We saw a local Hmong lady using a back strap loom to weave the beautiful borders on the bottom of the women’s sins (skirts). Lunch was at a little restaurant at the carpark of site 2. Only noodle soup on the menu but with lots of fresh veges & herbs to add it was really tasty. Stops at te Lao Lao (whisky) village (including a taste) and a bombed out Russian tank rounded out things till we headed for the Old Capital. Much bigger than I’d expected, rebuilt from the bombing during the secret war. 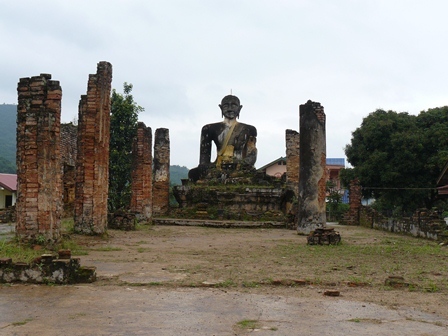 Stopped at Wat Phia Wat which is in ruins, only the columns and the seated Buddha remain – a legacy once again of the American bombing. The black stupa on a nearby hill is also badly damaged. The landscape around Muang Khoun is stunning, quite a wide valley much of it terraced for rice growing with very steep hills behind. Everything is so green, though there was considerable flooding around the town just a couple of weeks ago – the evidence of which is still white noticeable and includes a number of landslides. Back to Ponsavan about 5pm. Had to scrub our sandals – the mud is sticky, wet, thick and we made a pretty awful mess on the floor of the van. Have a couple more pics I'd love to upload but can't figure out how to post them and keep tem in 'portrait' so you guys don't have to turn your heads sideways to look at them. Anyone reading this who can provide hints on how to make this happen, I'd love to hear from you. Plan on checking out the town tomorrow - markets, two war memorials, Mulberries silk farm etc. Day 18… On the bus again…. Aaarrrghhhh! Day 12 - Suwan and the Tara boat..